A new year and four new players added for 2019 season. 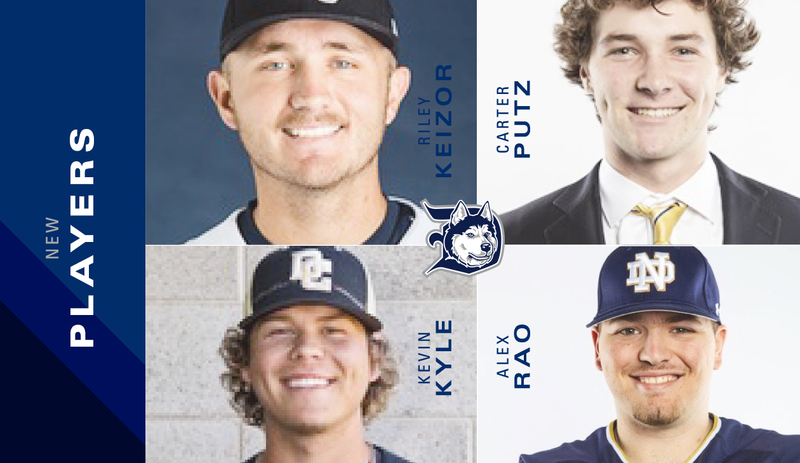 The Duluth Huskies Baseball Club is excited to announce the signing of four new players for the 2019 season. They are Alex Rao (RHP), Kevin Kyle (RHP), Carter Putz (2B&3B), and Riley Keizor (C). Alex Rao is a 6’4” right-handed pitcher from Home Sound, Florida and is a freshman at the University of Notre Dame. He graduated from Oxbridge Academy high school in 2018 During his time there, he earned four varsity letters in baseball and one in football. He finished his high school career with a 10-10 record, a 2.92 ERA (50 ER/119.2 IP) and 167 strikeouts, including going 3-3 with a 2.08 ERA (10 ER/33.2 IP) as a senior. Kevin Kyle is a 6’1” right-handed pitcher from Elk Grove, CA and a sophomore attending San Joaquin Delta College. His college stats thus far 15 games in 19 appearances with an ERA of 3.08. He made All-League honors in high school. This past season, he was named to the 2nd team All-Big Eight team and lead the Mustangs to a CCCAA league championship. Carter Putz is a 6’0” infielder from Kansas City, Missouri and is a freshman at the University of Notre Dame. In his high school career, he earned four varsity letters in baseball and three in football. He also led his team to state runner-up in baseball by hitting .460 (40-87) with 13 extra-base hits and 23 RBI. Carter was recognized for his hard work on and off the field with becoming a member of the National Honor Society and received All-Academic Achievement Award (4.2 GPA or better). He also made a spot on the Academic Honor Roll. Riley Keizor is a 6’0” red-shirt junior catcher from Beggs, Oklahoma. He started his college career at Northeastern Oklahoma A&M, where he spent his first two years and now plays for Oral Roberts. At A&M, he made all-conference as a catcher in 2017 and lead the team to the sixth rank overall in the NJCAA. His stats as a sophomore were; .394 batting average, 8 home runs, 12 doubles and 37 RBI in 48 appearances. As for this previous season, he was chosen to be the Summit League Newcomer of the year after leading his team with 35 walks in his first season as a redshirt sophomore. This led him to being on the All Summit League First Team. He has made 55 starts both behind the plate and at first base. These four young men will bring great experience to the Huskies while adding a lot of talent to the 2019 roster. Don’t forget to catch them play as the Huskies open up their home season on Sunday, June 2nd, 2019 against the Eau Claire Express. Until then, don’t forget to stay connected with the Huskies on the official website duluthhuskies.com and on all social media platforms, including Twitter, Instagram, and Facebook.